A.M. Anderson who has been the local agent of the American Express Company for many years has resigned. 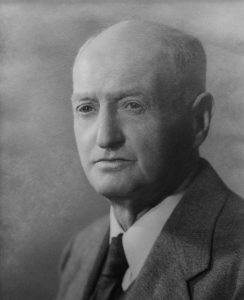 The office of the company has been moved to the depot where C. R. Fisher will act as agent. Norbert E. Francis was kicked on both legs by schoolboys last Monday night at the school play. He is under the care of a physician and is still in a “dangerous condition”. Wednesday night at the movies featured “Zeppelin’s Last Raid”. It was described as a rare treat that everyone should see. Admission is at the low regular price of 25-cents. Homer Ellis, Emil Matson, Erwin Gallagher, Erford Turner, Jay Bossingham, Halvor Reindahl, Harry Matson,and Arthur Alling have recently purchased a new Avery thrashing machine for use on their farms. Herbert Golden and family and Otto Hanson and family have moved into the Guysup house on Main Street. In the spring elections, R. D. Ozburn defeated Andrew Madsen for Village President 87-67. Rev. R. A. Barnes, district superintendent of the Methodist Church, and Dr. George E. Hunt with delegates from the Presbyterian Church spoke to a mass meeting of the two congregations concerning the possible union of the two churches. The meeting ended with a motion, made and carried, that the official boards of the two churches act as a committee to outline definite plans for federation including all the details and to submit a report of their plans for final action. Village President F. E. (“Steve”) Madsen signed a proclamation declaring April 5th thru the 12th as “Safety Week”. It was sponsored by the local Woman’s Club. Planning for the event were club president, Mrs. Rex T. Duter and event chairperson, Mrs. Earl Gransee. The focus was on school age children. Included were a safety poster contest, bicycle checks and various films on safety issues, etc. Winners of the poster contest were Wendy Kennan, Theresa Barger, and Donna Robson. About 90 village bike riders had their bikes safety checked. Marvin Ringen, Surge Milking Machine sales and service representative, advertised the latest advances in milking machines and offered an introductory price on the new equipment. OHS has a newly chartered chapter of The Future Business Leaders of America. The officers of the new chapter were, Mary Neath, president; Nancy Stone, secretary; Wanda Soule, treasurer; Lorene Stichter, vice-president; Dawn Grinnel reporter, and Mrs. Dorothy Roehl, advisor. The Village of Oregon Board appointed committee heads for the coming year. The chairpersons of the committees were Jack Statz, license and health; Kenneth Robert, street and Village Hall; Marvin Jensen, finance, Earl Lawson, zoning; Jay Bossingham, fire and police; Earl Lawson; cemetery and relief; Marvin Jensen, water and sewer; Earl Lawson, personnel; and Robert Weckerly, swimming pool. Ken and Donna Dary announced that they have opened for the season their A & W Root Beer Stand. The business was located near the present day Walgreens and Bank of Cross Plains. 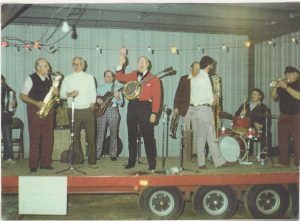 The Annual Firemen’s Dance was held at fire station, featuring Sammy Eggum and his Dairyland Jubilee Band. The Oregon Chamber Booster Band entertained at the Dane County Coliseum prior to the bowling events at the ABC National Tourney. 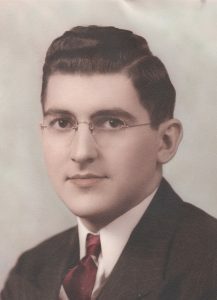 Members of the band were Tom Brown, Lloyd Jacobson, Bernard Freitag, Arnold Blahnik, Ron Erfurth, Bob Burns, Norm Champion, Howie Wilkes, and Orrill Ferguson. It was estimated that nearly 40 bowling teams from the Oregon/Stoughton area participated in the event. The newly opened men’s clothing store, The Squire, offered men’s suits for $79.95 for one week only. The special of the week were boys’ all cotton crew, T-shirts for 99 cents each. Lee Henriksen is the new meat department manager at Paul’s Supermarket. Others on the staff include Marvin Jensen in charge of the grocery department and Rich Mandervile, in charge of the fresh produce. Area State Jaycee Junior Bowlers came home with wins, giving them The Total Traveling Trophy for the coming year. The bowlers were Randy Kjellstrom, Jim Swinehart, Sue Flecthall, and Terrri Nyhus. 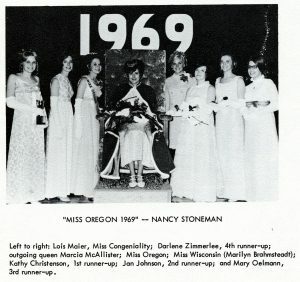 Nancy Stoneman is selected as “Miss Oregon 1969”. The OHS Concert Choir on their Eastern States tour performed at Carnegie Hall in New York City under their director, Tom Mielke and student accompanist, Amy Traska. Another highlight of the tour was the singing of “The Star Spangled Banner” at Ellis Island. The OHS Marching Band returned from the spring competition in St. Petersburg, Florida with several awards. 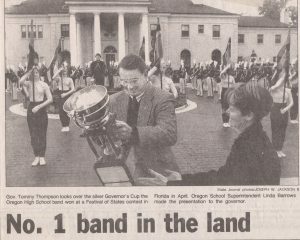 Oregon placed fourth in the Field Show Spectacular; second in the Concert competition; and placed first in the Marching Band competition (“Governor’s Cup”). Oregon also came back with the Best Overall Band Presentation. Steve Spiwak was their director. Zeke Dasho (Judge Gaffney); Rebecca Mattens (Nurse Kelly); Bert Anderson (Mr. Wilson); Julie Wood (Mrs. Chauvenet); and Pat Newman (tax driver). 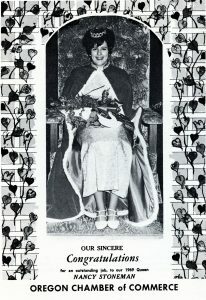 Louise Uphoff directed the play. The Village took steps to form an Economic Development Committee. The committee will consist of the Village President (or designee), one trustee, one member of the Planning Board, two representatives from the Chamber of Commerce and four village citizens at large. The Oregon Rotary Club celebrated its 50th Anniversary with a banquet at DJ’s Steak House. 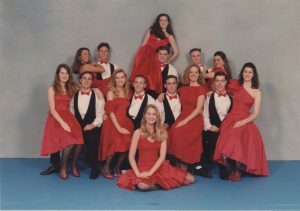 Ginger’s Dance School 1994 group, dressed for the “Lady in Red” performance. Front: Kristin Woodworth; Middle: Dawn Zuelke, Paul Rebman, Jenny Cornwall, Jeff Bellus, Amos Mikkelson, Dena Schneeberger, David Zuelke and Carrie Loftus. The Pizza Pit opens at 105 South Main Street. It is franchised to Russell Hellenbrand. The twin brother dentists, Michael and Mark Nelson, announce their intention to retire after nearly 34 years of being in business. They opened their offices in downtown Oregon in 1975. The Oregon Mites Hockey Team finished second in state competition at Beaver Dam last month. Some members of the team (7 and 8 year olds) included Hayden Bell, Ben Lynch, Ben Reichert, and Tyson Rohrer. Their coaches were Paul Lynch and Tony Renlund. The Village Board makes final arrangements to clear the Florida Avenue floodplain with the movement of three more homes by the end of June. 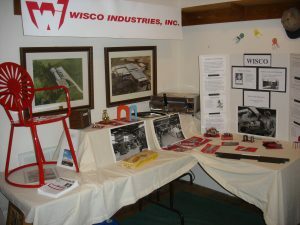 With the downturn in the economy, Oregon’s largest private employer, Wisco Industries, Inc., was forced to cut staff and reduce hours. 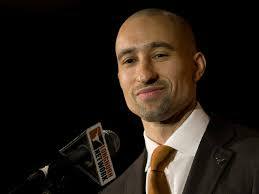 Shaka Smart, former OHS athlete, takes over as the men’s head basketball coach at Virginia Commonwealth University. He graduated from Oregon High School in 1995. In the spring elections Wayne Ace (584 votes) and Chris Johnson (518 votes) won the two seats for Town of Oregon Supervisor. The Town of Oregon Chairman was won by Daryl Weber (494 votes) over Rick Anderson (425 votes). The Village races all ran unopposed. The race for a seat on the School was again won by Steve Zach over challenger Daniel Biersdorf. The OHS boy’s tennis team gears up for the 2009 season. Returning lettermen were Kyle Onesti, Justin Helmkamp, Brian Jacobs, Jake Butterfield, Taylor Tachon, Joe Sanford, Tony Ceithamer, John Thompson, Jon Dundore and Jake Torpy. Paul Morrison, owner of The Wood Cycle, moved a barn in January from the Alpine Meadow neighborhood to his property on Fish Hatchery Road. The basement of the barn will be a workshop and the main floor a show room for his local wood products. The Village Board transfers a 20-acre parcel in Jaycee Park to the Oregon School District.